This past Saturday night Brian Vera was robbed of his big fight and his big chance in a sport where the big chances rarely happen once. Such an event is nothing new from a sport that has been carrying various forms of corruption since the 18 century. Judges rob boxers of their victories all the time: that happens. This robbery, however, feels a little worse than most. Not because of the inaccuracy of the scorecards, but because of the likely results to follow. Julio Cesar Chavez will go on to have other big fights with big paydays, while Brian Vera will most likely go back to being an opponent. Vera deserves his big victory. If he should land another big match he will again be the other guy, the man who’s brought in to lose and make the main attraction look good. Everything was against him in this fight. From the start he was the smaller man; overshadowed by his opponent’s physical size and (more significantly) his opponent’s name. As the days went on and Chavez continues to make a mockery of the weight classes, Vera’s disadvantage in size continued to grow, while his disadvantage in clout was on full display. The details of the scoring are worse than the actual result. Some scoring can be attributed to human error. Carla Caiz’s score of 96/94 in favor of Chavez is within the margin of what most would consider reasonable human error. My personal card had it reverse: 96/94 for Vera. This means there was a difference of opinion on only two rounds. Enough of the rounds were close that such a discrepancy is acceptable. By contrast, Marty Denkin’s score of 97/93 and Gwen Adair’s 98/92 card don’t seem to be the product of simple human error, or a difference of opinion. People want to love this sport —they really do. But boxing makes it hard for them to love it. A dissatisfying ending to a good fight can ruin the viewer’s feelings for the match and makes him less likely to watch boxing in the future. Fans won’t return if they believe that the actual match in useless because the judges will simply change the results to fit their desire. This fight was particularly hard to accept because of all the work Vera and his team have done to improve his style. Vera has had several setbacks in his career. Before the Chavez battle there were six losses on his record. But those dips in his career had been met by peaks as well. He generally lost to good fighters and was never seen as an easy fight. Most importantly, he continued to improve after his setbacks. Working with his trainer, Ronnie Shields had brought Vera several of his best career wins in resent fights. All his hard work at improving himself came down to this moment. He had a victory against one of the biggest names in the sport. He deserved to win. And he was robbed. The one shining example of positive magistrates was the referee, Lou Moret. Chavez continually complained of low blows but the ref correctly refused to call fowl. Right before the match Moret, as is customary, indicated to the fighters that a shot would not be low if it lands on the elevated belt line. 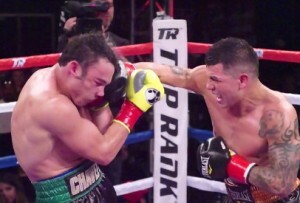 Chavez’s complaints were nothing more than an attempt to slow the barrage from the myriad punches coming from Vera. He knew he was losing and, since his fists weren’t getting the job done, he was looking for help from the ref. Moret had none of it. If Chavez stays around this weight and tries to go against a full-fledged Super Middle Weight he’ll likely find that fights get tougher when his size advantage is not so profound. This decision hurts the sport of boxing, but there have been bad decisions in the past and there’ll be plenty more in the future. The thing that really hurts is the fact that a good fighter was robbed of his biggest win and probably won’t get another chance to add another top name to his resume. Next boxing news: “Left-Hook Lounge Mailbag”: Chavez Jr. at 168, Cotto’s Last Dance? & Khan’s Pursuit of Mayweather!! !